Swarthmore's staff are fully behind this mission, from the world-class professors who engage directly with students in meaningful ways, to the staff in the dining hall, coffee bars, and libraries, who can come to feel like friends. Close relationships with community members fuel life at Swarthmore. Many students collaborate with their professors on joint research projects, and the exchange of intellectual ideas between students and faculty is facilitated by small class sizes. The Honors Program extends the depth of free and critical discussion of ideas via small-group seminars. One trademark of a "Swattie" is the desire to learn for the sake of knowledge, and the pursuit of interests inside and outside the classroom. Swatties can be astrophysicists who write poetry, economists who love to code and athletes with a passion for choreography. 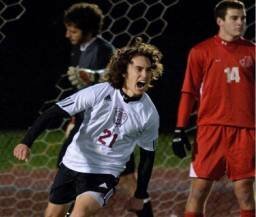 Almost half of the student body enjoys playing sports, whether it's at the competitive Division III level, or in more casual club and intramural sports teams. The College's Quaker roots emphasize the concept of access regardless of income, this manifests itself in a cash-free campus; the annual activity fee covers everything from digital printing and sporting events to campus movie screenings and dance performances. Swarthmore's financial aid program ensures affordability--without loans. Almost 60 percent of the Class of 2021 received aid in 2016-17, with an average award of $51,111. Swarthmore makes admissions decisions for U.S. citizens and permanent residents without considering a family's ability to pay. 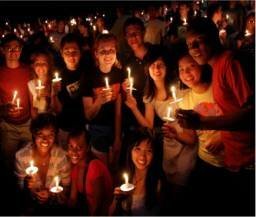 International applicants are admitted on a need-aware basis, and are eligible for financial aid. First-year applicants may apply to Swarthmore via Common Application, Coalition Application, or QuestBridge Application. Swarthmore does not have a preference among any of our application options. Please submit only one application in an application year. As part of the Common or Coalition Application, you will be asked to submit no more than 250 words in response to the following short answer question (Questbridge applicants are asked this question on our Questbridge Conversion Form): "Please write about why you are interested in applying to and attending Swarthmore." Midyear grades: If your school does not have midyear grades, please provide a midyear progress report from your teachers. You may request an on-campus or off-campus interview. You may interview before submitting your application. You may submit a creative supplement with art, music, dance, theater, or creative writing materials. We accept supplements exclusively through SlideRoom, which provides instructions for submitting materials online, including a video tutorial. Please use the SlideRoom link that matches your choice of application. Submitting additional materials is strictly optional, and is at no additional charge. Please review financial aid application instructions and deadlines for first-year applicants. 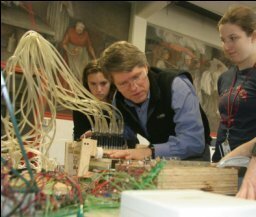 The interdisciplinary nature of the college's curriculum allows unique opportunities for academic discovery. 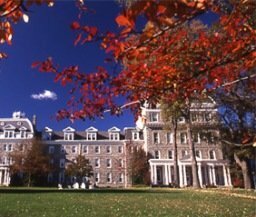 For example, Swarthmore offers a wide array of courses in distinct and intersecting disciplines, with courses such as Race, Gender, Class and Environment which draws from multiple departments, including Black Studies, Sociology/Anthropology, Gender and Sexuality Studies, and Environmental Studies. Students have the chance to craft special majors, with recent examples including Medical Anthropology, Behavioral Economics, and Sustainable Development Studies. 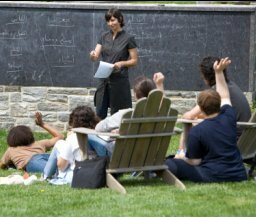 Swarthmore's program in education leads to Pennsylvania secondary school certification. All students have significant undergraduate research opportunities in the natural sciences, social sciences, humanities, and engineering. One hallmark of the college's academic program is that first-year students take their fall semester courses pass-fail. Swarthmore encourages its students, many of whom spent their high school careers concerned about GPAs, to focus on learning for the sake of knowledge. The pass-fail semester provides a true sense of discovery for students, as they are empowered to experiment with new fields. Many students identify potentially life-changing passions, while knowing that they're free to make academic mistakes in the process. 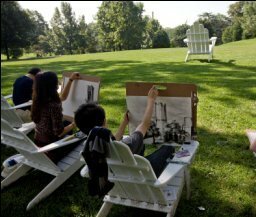 Swarthmore recognizes that adjusting to college is a learning process, and achieving a balance between engaging in the campus community both inside and outside of the classroom is vital. Some Swatties decide to take a deep dive into their area of interest. Those students find their intellectual home in Swarthmore's Honors Program. Modeled on the Oxford tutorial system, it features small groups of students working collaboratively with faculty to explore topics through spirited debate and thoughtful exploration of ideas. At the close of their senior year, Honors Program candidates are evaluated by visiting examiners, such as Federal Reserve economists and directors of world-class theater companies. You know you've truly mastered a topic when it's time to discuss your ideas with brilliant strangers. Swarthmore's Career Services does its part to help students reach their fullest potential by offering a variety of useful resources. Personalized career counseling advises undergrads on their options for major selection, internships, externships, and graduate school applications. The Career Cafés engage the community on broad topics, like women in leadership or sustainable farming, that may have career implications. And, of course, a packed events calendar lets students network with alumni, attend panel discussions, and impress potential employers at recruiting consortiums. Take note of Swarthmore's extensive externship program. It matches students with alumni volunteers for week-long job-shadowing experiences in laboratories, museums, publishing companies, labor unions, leading think-tanks, and other places where you might like to work someday. Alumni who visited PayScale.com reported an average starting salary of $60,000, and 44 percent think their work makes the world a better place. 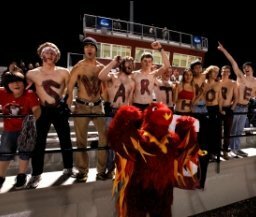 Lots of schools have Honors Programs, but the unique program at Swarthmore might just be its most distinguishing feature. About one third of Swarthmore students work towards Honors distinction throughout their junior and senior years. Honors candidates create a program for themselves made up of four "preparations" (i.e. a seminar, thesis, or research project) in at least two disciplines. One of the fantastic things about the program is that it's entirely defined by the students. At the end of the program, external examiners who are experts in their fields, such as theater professionals from the Tisch School at NYU and Google software engineers, come to evaluate honors candidates through written and oral examination. Dr. Amy Vollmer, chair of Swarthmore's biology department, explained, "During one weekend in May, hundreds of honors examiners arrive on our campus. All of the oral exams take place in a matter of two days." Seniors who have been creating and nurturing groundbreaking ideas, get to then demonstrate what they've been learning and doing—to an expert. 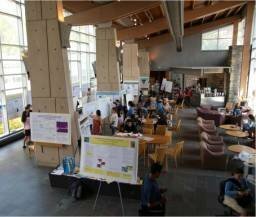 Their ideas are expressed and analyzed in a full discussion usually reserved for a graduate thesis defense, which can be a daunting yet exhilarating experience for students. Dr. Vollmer said that the program is unique in the way that experts in the field are introduced to Swarthmore's best and brightest. Swarthmore's reputation for scholarship returns with the honors examiners to their home institutions, a very useful rep to have when students are later applying to graduate school. Still, she said truly "the only priority at Swarthmore is undergrad." There's no "this will be useful later" mentality. Swarthmore students' work is always useful and relevant, right now. For 2017-2018, the College charges, including tuition, room, board, and student activity fee, amount to $65,774. The activity fee covers not only the usual student services--health, library, laboratory fees, for example--but admission to all social, cultural, and athletic events on campus. 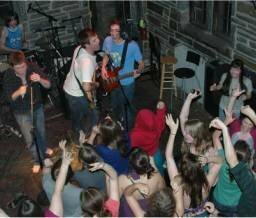 In addition, the College's Quaker roots manifest themselves in a cash-free campus, as the annual activity fee covers everything from digital printing and laundry to sporting events, campus movie screenings, and dance performances. Swarthmore's commitment to financial aid and access is at the core of our educational mission. We understand that students are admitted from a variety of economic backgrounds. The College strives to make it possible for all admitted students to attend Swarthmore, regardless of their ability to pay, and meets 100% of determined need for all admitted students. If you are a U.S. citizen, permanent resident, or undocumented/DACA student graduating from a U.S. high school, the decisions about your admission to Swarthmore and your financial aid eligibility are made independently. Nearly 60 percent of our entering class received need-based Swarthmore Scholarship aid from an overall financial aid budget of just under $40 million. Our aid awards consist of grants (which do not need to be repaid) and the expectation that students will work in a part-time campus-based job. Although Swarthmore financial aid awards are loan-free, your family might choose to borrow a loan to pay a portion of the educational expenses. The beauty of Swarthmore's 425-acre campus is immediately striking. Students draw inspiration from the meticulously-tended gardens, stunning arboretum specimen trees, and variety of woodsy trails. 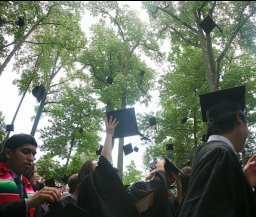 Each fall, The Graduate is screened on the lawn in front of Parrish Hall, allowing students to contemplate life beyond Swarthmore, and seniors to chant their class year with reckless abandon. With Philadelphia less than 30 minutes away, and New York City and Washington, D.C. within a 90-minute train ride, Swatties enjoy connecting to the wider world. The close-knit community allows each student to have access to the college's wide array of opportunities, such as the student who, partly on the strength of helping to build a database of Crum Woods ecological data, was offered a position at Google. The bottom line: Swarthmore's sense of place prepares you for anything and everything. Our alumni are equipped to make the most of where they've been—and make sense of what they haven't yet seen. 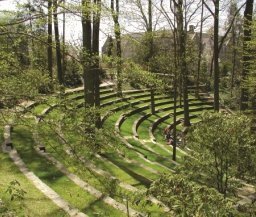 Swarthmore provides a dynamic array of arts spaces for students to enjoy or stage a performance—including a professional theater facilities. Students explore their interests across campus, by learning a new dialect through immersion with Language Resource Center technology, making sense of the stars in the Peter Van de Kamp observatory, and working on social equity projects through the Lang Center for Civic & Social Responsibility. The forthcoming biology, engineering, psychology (BEP) building will feature cutting-edge labs and collaborative work spaces. The new Matchbox fitness facility offers a multifaceted, modern approach to wellness, recreation, and community. Whether students are snacking on a samosa while editing a project at the Media Center, or chatting with friends about summer research over a meal at Sharples, the abundance of campus resources permeates life at Swarthmore. 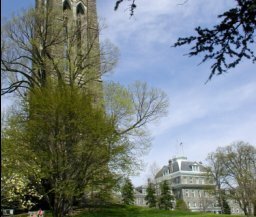 Swarthmore belongs to the Tri-College consortium, which links to nearby Bryn Mawr and Haverford Colleges both academically and socially. In addition, students can take courses at the University of Pennsylvania, a short train ride away. These extensions of the Swarthmore experience allow students to expand their intellectual and social capital, such as watching a play at Haverford, connecting with a Penn professor about an internship reference, or practicing with an a capella group at Bryn Mawr. The College offers shuttles to the other Tri-Co schools, community service sites, local restaurants and shops, and more. The train station at the edge of campus invites students to explore the rich cultural tapestry of center city Philadelphia (less than 30 minutes away). Swarthmore’s Quaker heritage fuels its verve for environmental stewardship. The College buys renewable energy credits for 125 percent of its electricity use and, through its Climate Action Plan, is committed to reaching carbon neutrality by 2035. All new construction is certified LEED Silver or higher, which aligns with the College’s intention to apply the highest standard of sustainable construction possible to its planned Biology, Engineering, Psychology building. Ninety-seven percent of Swarthmore students live on campus, relying on bike- and car-sharing programs and public transportation. There’s more: dining services allots nearly half of its food budget to local and organic ingredients. The College composts over 200 pounds of kitchen scraps and post-consumer waste daily and recycles vegetable oil — reducing carbon dioxide as much as planting 2,024 trees would. And the stormwater management approach deploys porous pavement, rain gardens, infiltration beds, and 31,000 square feet of green roofing to control runoff. But environmental stewardship isn’t just an over-arching ethic at Swarthmore. It’s personal. Among the student-supported efforts is the Crum Creek Monitoring project, for which they help to test chemicals and track the watershed’s vitality. Another source of pride is the Good Food project, whose community-built, organic garden stokes sustainable food practices. Downtown Swarthmore and nearby Media, Pa. The Swarthmore campus is served by regional rail making travel to these and other destinations easy and convenient. Philadelphia International Airport is approximately a 20-minute drive from campus. Taxis, rental cars, or SEPTA commuter trains are available. Amtrak trains serve Philadelphia’s 30th St. Station, and from there visitors may take the SEPTA Media/Elwyn Line to the Swarthmore station on the edge of campus. Greyhound buses serve Philadelphia from many cities. From the bus station, visitors may walk to the Market East train station and take the SEPTA Media/Elwyn Line to Swarthmore as described above. If heading east on the Pennsylvania Tpke., take Exit 326 (Valley Forge); then, take I-76 E. (Schuylkill Expressway) 2.5 miles to I-476 S. Proceed on I-476 for 13 miles to Exit 3 (Media/Swarthmore). At the bottom of the exit ramp, turn left onto Baltimore Pike. Stay in the right lane, and in less than a quarter mile, turn right onto Rte. 320 S. At the first light, turn right to stay on Rte. 320. Proceed to the second traffic light (College Ave.) and turn right. On College Avenue take the first right onto Cedar Lane. At the next stop sign turn left onto Elm Avenue. Turn left onto Whittier Place, marked by stone pillars. Proceed to the end of Whittier Place and turn right into the DuPont parking lot. The entrance to the Admissions Office is through the archway at the back of Parrish Hall. If heading west on the Pennsylvania Tpke., take Exit 333 (Norristown) and follow signs for I-476 S. Stay on I-476 for 17 miles to Exit 3(Media/Swarthmore). Follow above directions from that point. From the New Jersey Tpke., take Exit 3 and follow signs to the Walt Whitman Bridge. After crossing the bridge, stay to the right and follow signs for I-95 S. Take I-95 S., pass the Philadelphia International Airport, and continue to Exit 7 (I-476 N./Plymouth Meeting). Take I-476 N. to Exit 3 (Media/Swarthmore). At the bottom of the exit ramp, follow the sign for Swarthmore by turning right onto Baltimore Pike. Follow above directions from that point. If heading north on I-95, take Exit 7 (I-476 N./Plymouth Meeting) and merge onto I-476 N. Take Exit 3 (Media/Swarthmore). At the bottom of the exit ramp, turn right onto Baltimore Pike. Follow above directions from that point.